Today was a great day at Eastside as we shared our students’ success with another district in the state! 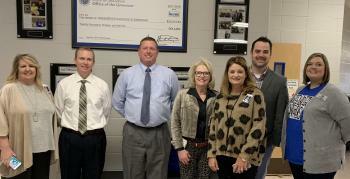 Administrators from Greenwood, AR came to visit with us about our work with Solution Tree and our learning as a Professional Learning Community. They were most interested in how it has affected our student learning. We were proud to share our growth from the beginning of the year to now and from last year to this year. Our teachers are working hard to collaborate and plan engaging and meaningful lessons for Eastside students and others are taking notice. Greenwood learned about our schedule and how we work with each and every student during our PROWL time to meet their unique needs. We discussed how teachers and students alike track and reflect on data in student data notebooks. Teachers shared how they use student data to drive instruction. It was a great day of learning from each other as professionals and sharing what great things are happening at Eastside, The Greatest School!